Spectacular Penthouse Condo on the Beach! Location: Playa Langosta, one of the world-famous beaches of the Northern Pacific Coast of Costa Rica, Tamarindo, Guanacaste. One hour from the international airport in Liberia, Costa Rica. Accommodations: Condominium – 3 bedroom + sofa bed - 3.5 baths – Sleeps 6 - 8. This two-level penthouse condominium is RIGHT ON THE BEACH! It is situated in the nicest condominium complex in the best area of Tamarindo. Each level has its own spacious balcony for spectacular views of the Pacific coast. Words cannot describe the appeal of this NEW CONSTRUCTION, LUXURY residence. The architectural details appeal to the most discriminating tastes, from the barrel-vaulted ceilings and recessed lighting to the pebble-inlaid tile flooring and carved custom pillars. Tastefully decorated by a designer, the condo’s decor is as breathtaking as its architecture and is only outshone by the natural beauty of its setting. Three bedrooms each offer luxurious accommodation for travelers. Each has a private bath with luxurious fixtures and trim. Twin beds in the guest bedroom provide bedding for two visitors which can be converted to a King bed if you prefer. The two master suites, one per level, each have king sized four-poster beds with down comforters and crisp linens. Both suites open on to large covered terraces overlooking the ocean, and to Juliet balconies which share the spectacular view. The terraces, too, benefit by the designer touch. Each has comfortable and harmonio us furnishings. The lower terrace has, along with two rich-colored couches, a large dining table which seats six in style. A ceiling fan, bamboo roof and dangling multi-colored lighting complete this dream-like outdoor living room. The kitchen is a modern, fully-equipped kitchen with stainless steel appliances and granite counter tops. Coffeemaker, blender, microwave, disposal, dishwasher and beautiful crockery, silverware and glassware make this kitchen a delight for the cook. The condo also has a large flat screen TV which receives many channels both in Spanish and English, as well as a slim-line DVD player. Most importantly, the condo has wireless internet access for both work and play, making a visit to Playa Langosta almost as convenient as staying home – only MUCH, MUCH MORE BEAUTIFUL. The location is unbeatable. Located directly on the glorious Langosta Beach, reverenced by surfers and nature-lovers alike, the condo is less than a mile south of Tamarindo. Tamarindo itself has all the amenities of a thriving town and is replete with restaurants, bars and shops, but still retains the quaint Costa Rican charm. So come to Langosta! If we could live here ourselves full time we wouldn’t dream of renting it out, but as we can’t, come enjoy our little piece of Paradise. Savor the beauty of nature as well as the comfort and elegance of a well-planned luxury home. Want to learn to surf? Now is the time, with the world-class instructors in Tamarindo. Want a relaxing massage? Let trained professionals come to your home-away-from home and give you a massage on your own terrace. Stroll the beach or walk through the jungle and hear the parrots and see the howler monkeys. Sip wine on our terrace and relax into a world-class vacation. 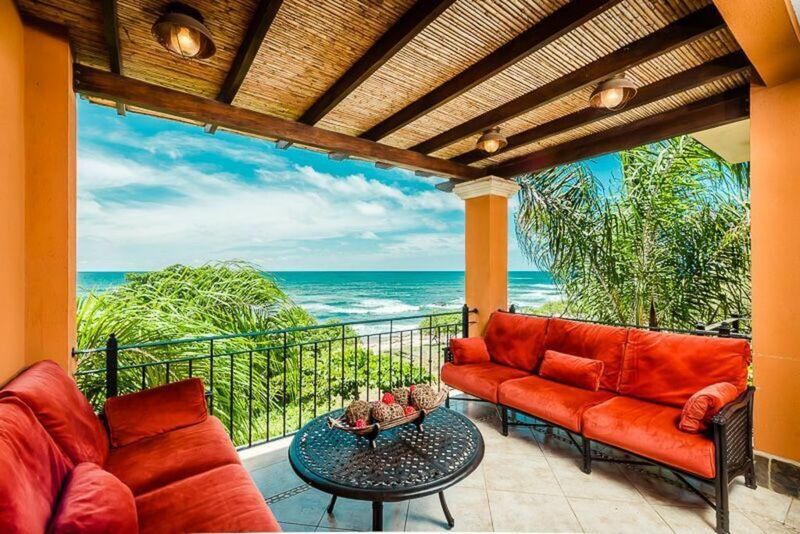 Incredible views of the ocean and Langosta beach from both levels of this penthouse unit. This condo complex is one of very few that is actually ON the beach. Free local telephone in condo. Coffee maker, toaster, blender, food processor and a full compliment of kitchen necessities. There are also dishes, glasses and utensils for 12. 2 Juilet balconies, one on each floor. A large main floor balcony with two long couches, a large dining table for six, and an incredible view of the ocean and beach. Beautiful pool with a view of the ocean. We had a fantastic time. The condo was more beautiful than the pictures. The views from both master bedrooms are simply amazing!! Jane was very helpful in our arrival accommodations. The Italian restaurant (fish and cheese) was fantastic. Good wine and good food. Would Defitey stay at this condo again. We have been renting through VRBO since 2004 and Jane was by far the most helpful owner we have ever come across, she answered all our questions patiently and fully and nothing was too much trouble, as it was our first time in Costa Rica this was a great help . Jane organised a van to pick us up and take us to the airport so we didn't have to rent a car which was great and we were able to walk into Tamarindo and to several restaurants close by, Walters Fish & Cheeses (great restaurant and a lovely deli selling fresh rolls, cheese, meats), Le Cave, (daily specials and a wine cave) Capitain Suisos (Great Happy Hour and food) and there is a pizza place right across the street for eat in or carry out. The condo was great and had plenty of space for 5 adults, nicely furnished and the views of the sunsets from both balconies were spectacular. We cooked on the grill and enjoyed eating in a couple of nights in the a/c or on the balcony and we had everything we needed to prepare our meals. We did have Christina from Sunset Catering pre stock for our arrival and that saved us taking a cab to the large Auto Mercado which turned out to be a great idea as due to bad weather we missed our connection and didn't arrive until almost midnight, it was so nice to get up in the morning and have everything we needed for breakfast and lunch. The small mercado across the street had everything else we needed after that including wine, liquor, bread and fruit and vegetables, The pool was a perfect place to relax and still be able to see and hear the ocean, great for a lazy day or a dip after returning from a day out. RPM, the management company were right across the street and if we had any problems we could just call and they came out promptly, and they also booked our trips for us, very convenient. We even had a cleaning service twice in our 10 day stay. Everything about the vacation was relaxing and stress free, thank you Jane for sharing your beautiful condo with us and we hope to come back one day. This condo was as beautiful as the pictures. Right on the beach with a swimming pool on the property perfect for cooling off. Gourmet kitchen with plenty of dining room space. Great outdoor space for sitting or dining. Beautiful sunset views. Furnishings are nice & comfortable. plenty of towels and kitchen supplies. 24 hr guarded entrance, safe & secure location. The condo was all we expected and more. The views were spectacular, and the living arrangements for our family of five adults was great. Jane, and the owner, answered all our questions quickly and completely. The location is a couple of kilometers from Tamarindo which got us away from the crowds but still close to the action. We would stay here again. The condo is beautiful with stunning views of the beach and gorgeous sunsets. It has a well equipped kitchen and is also close enough to a busy, fun little town that has great restaurants. We will certainly be back...Highly recommended. There is a brand new skateboard park in Tamarindo. $300 last minute discount off of a week, if booked within two weeks of trip. Rates are subject to change until reservation is confirmed. The first payment of 25% is non-refundable. The second payment is non-refundable 60 days ahead of check-in. Rates include all taxes and fees, as well as housekeeping. * HomeAway/VRBO now charge a service fee when you book a reservation. This is not my fee.